Hillary Clinton and Donald Trump held their first presidential debate in New York last night, and the whole ordeal was an exercise in fact-checking and frustration. Thankfully, our favorite late-night voices of reason were quick to respond to the verbal sparring match we watched through covered eyes. Stephen Colbert's Late Show team covered the debate in real time, while Jimmy Kimmel's "Lie Witness" squad employed a more creative strategy that could use some fact-checking of its own. 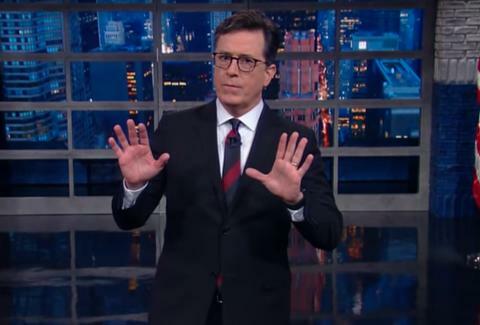 Here are the sharpest late-night debate takedowns so far. Colbert took issue with some of Trump's truth-fudging, but he is definitely on board to reboot Law & Order. Trevor Noah's "2 Podiums 2 Furious" recap features a (bad) Trump impression, (good) Photoshopping, and (great) O.J. comparisons. Seth Meyers takes an extremely "Closer Look" at the debate -- in other words, you'll know exactly how many times Trump drank a glass of water and said something stupid in record time. Kimmel's "Lie Witness News" squad wouldn't let something as pesky as the debate not happening yet get in the way of their coverage. We would have believed there was a pull-up match, too. Skipped the debate? Don't worry, so did Corden, who took the opportunity to casually plug his network's MacGyver reboot -- which, it turns out, isn't all that different from Lester Holt's political trajectory. Andy Richter made a drinking game for the debate... kind of. Sorry, Janice. Looking for more laughs at the candidates' expense? Don't worry, we'll be adding more as more hosts react -- and (un)fortunately, we've got two more of these things left. Check out the full schedule to find out when the next presidential debate is happening.